It has been a very busy six months with amazing people doing some fantastic fundraisers and making generous donations. 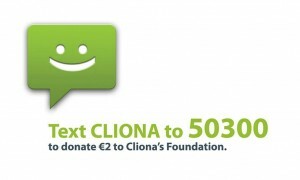 The profile of Cliona’s Foundation has also increased significantly through national and regional media platforms. We have met some inspiring people that have been only too happy to help us but also inspiring families that have shared their very personal stories with us. 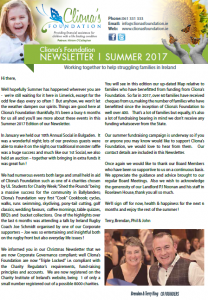 We know that all the funds raised which we in turn distribute to families of children with a life limiting condition make a huge difference and this is what reinforces for Cliona’s Foundation the need and importance of the support we provide. Can you organize some small fundraiser among your family, friends or even work colleagues? Maybe you are in a company that selects a charity partner for various annual events and could possibly also nominate Cliona’s Foundation to benefit?